NEW YORK, March 5, 2015 – Research released today from leading global public relations firm Weber Shandwick identifies that chief executive officer engagement and visibility is recognized as particularly critical to company reputation, according to 81 percent of senior executives worldwide. This new model of building CEO reputation is driven by the high demand for content and by the numerous platforms on which leaders can engage with stakeholders in today’s digital era. Conducted by Weber Shandwick with KRC Research, The CEO Reputation Premium: Gaining Advantage in the Engagement Era, is based on an online survey of more than 1,700 senior executives across 19 countries in North America, Europe, Asia Pacific and Latin America. It’s undeniable that CEO reputation matters to an organization’s success and is one of its most valuable and competitive assets. Global executives in our survey agree: on average, they attribute nearly half (45 percent) of their company’s reputation to the reputation of their CEO. This inextricable link between CEO and corporate reputation is only expected to strengthen, as 50 percent of executives expect that CEO reputation will matter even more to company reputation in the next few years. CEO reputation matters to the bottom line, too. Executives estimate that 44 percent of their company’s market value is attributable to the reputation of their CEO. Strong CEO reputation also attracts and retains employees (77 percent and 70 percent, respectively). Despite the growth in importance of CEO reputation, building it is not about enhancing egos or celebrity. In fact, a Weber Shandwick media search found that 2014 was a record year for coverage related to CEO humility. “Humility is now the new green among chief executives,” according to Gaines-Ross. Indeed, executives with highly-regarded CEOs in our study are nearly six times as likely as those with less highly-regarded CEOs to say that their CEO is humble (34 percent vs. 6 percent, respectively). With the high demand for CEOs to narrate their companies’ purpose and what they stand for, it is good to know that the number and types of communications activities are plentiful, offering a variety of strategic options for CEOs to use. Compared to European, Asia Pacific and Latin American executives, North American executives perceive their leaders to be better communicators, both internally and externally. North American executives are significantly more likely than those in other regions to say that their CEOs are comfortable talking to the news media. However, these regions may soon catch up: Four in 10 European executives (41 percent) and approximately half of Asia Pacific executives (49 percent) and Latin American executives (49 percent) report that their CEOs are more willing to talk with the news media today than they were several years ago. Canadian executives are the most likely to say their company has a very strong reputation (63 percent). Indonesian and Chinese executives are particularly optimistic that CEO reputation will rise in importance over the next few years (87 percent and 79 percent, respectively). Weber Shandwick recommends that business leaders and their companies consider the following strategies to bolster CEO engagement. These recommendations are described in detail in our report. 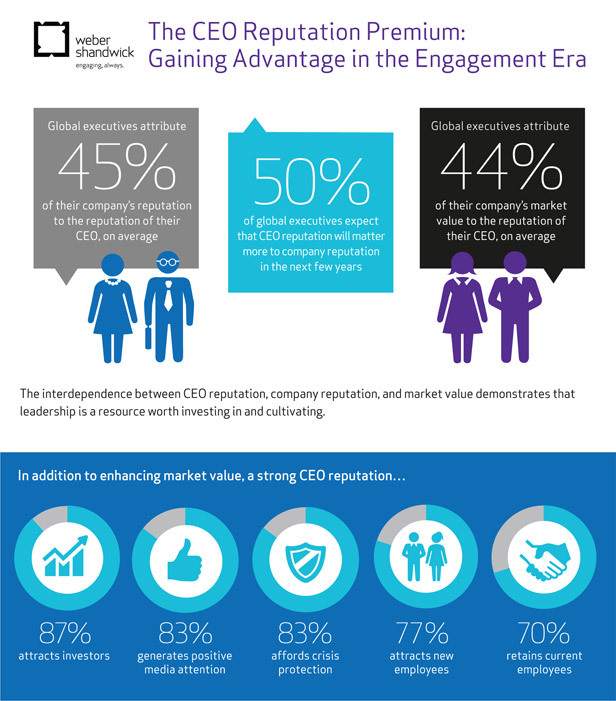 Click here to view The CEO Reputation Premium: Gaining Advantage in the Engagement Era report and infographic. Over the next several months Weber Shandwick will be releasing supplemental reports based on this study, including one focusing on women CEOs. An online survey of more than 1,700 executives – managers through the C-suite, but excluding CEOs – was conducted in 2014. Respondents worked in companies with revenues of $500 million or more (or regional equivalents) and represented 19 countries across North America, Europe, Asia Pacific and Latin America. The margin of error for the full global sample is ±2 percentage points with 90% confidence. Weber Shandwick is a leading global public relations firm with offices in 81 countries. The firm’s diverse team of strategists, analysts, producers, designers, developers and campaign activators has won the most prestigious awards in the world for innovative, creative approaches and impactful work, including being honored as an Ad Age A-List Agency in 2014 and 2015, and The Holmes Report’s 2014 Global Agency of the Year. Weber Shandwick and its Prime unit have won a combined 23 Cannes Lions since 2009. Weber Shandwick was also named a Best Place to Work by Ad Age in 2014 and PRWeek in 2013 and 2014. The firm deploys deep expertise across sectors and specialty areas, including consumer marketing, corporate reputation, healthcare, technology, public affairs, financial services, corporate social responsibility, financial communications and crisis management, using proprietary social, digital and analytics methodologies. Weber Shandwick is part of the Interpublic Group (NYSE: IPG). For more information, visit http://www.webershandwick.com.